INDIANA- CASES offer a complete range of indestructible durable waterproof cases - the best answer to the needs of sophisticated users for the most diverse and extreme applications:. Being one of the trusted organizations in the market, we are indulged in providing a wide range of Waterproof Camera Case. We are manufacturers and suppliers of supreme quality Underwater Mobile Covers. These Underwater Mobile Covers are exclusively designed to mount on ponds and fountains to add fascinating appearance. We are the leading firm of Soft Mobile Waterproof PVC Pouch. In addition, we present this product at nominal rates. 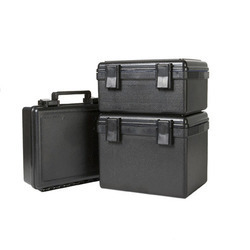 Turtle LTO case 30 capacity with Jewel Case, Size/Dimension: 20"x17"x8"
Carton Dimensions: 20" X 17" X 8"
We are providing a large assortment of HP Data Cartridge. Ava Marine services has tied-up with Aquapac International Limited to sell their range of 100% waterproof, use-throw protective cases. TRACO POWER-The new TEX series are industrial power supplies in a rugged die-cast aluminium enclosure. The design is water (incl. sea water), ice, oil and dust proof and complies with IP67 and NEMA 4X standards. They feature a high operating temperature range from –40°C up to 85°C. Safety approval includes ATEX 94/9/EC and IECEx for applications in hazardous locations.